Book your Inflatable rentals online now! Inflatable rentals are a must for any event. Some people call them moonwalks, bouncy house, jumping house or inflatable jumping rentals. We have them all and we call them fun. We are a local, family owned business located in Saraland AL. We are currently serving all of Mobile County and nearby cities (Atmore, Bay Minette, McIntosh, Calvert, Spanish Fort). All of our inflatable rental prices include dropoff, setup, and pickup. The only additional cost you may incur would be an additional travel fee. This fee generally only covers our additional travel expenses to deliver your party rentals. North Mobile would not have an additional travel fee but the farther away we have to drive, the travel fee increases. Most of South Mobile is between $20-$45 but areas like Atmore are $50 or more. Once you start an online order, the travel fee will display in your shopping cart. 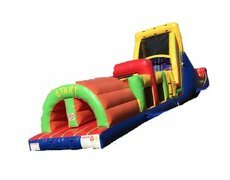 When we opened Spartan Inflatables, we wanted to have easy, no hassle online ordering. We believe this website has accomplished that. The first step is to choose which type of party rental you are wanting. 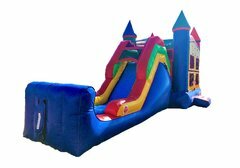 If you are looking for a bounce house rental, just click on the box above with an image of a bounce house and it will show you all of our bounce house rentals in Mobile AL that you can choose from. Once you see one you like, you click on it to view more pictures, videos, and details about the item. Then you add the item to your cart and begin the checkout process. No worries about asking us if it is available, our website will only allow you to choose days that it isn't already booked. Once finished, you pay your deposit, sign your contract, and don't worry about anything else. You will receive a confirmation email with all your party rental details. We will give you a call, usually the night before your party, to discuss setup times. We try to give you as small of a delivery window as possible (to keep you from sitting around waiting on us like we are the cable company), usually about a 30 minute window. Rest assured, we will be there on time. Of course, things happen (wrecks, traffic, another customer didn't hear us ringing the door bell for 20 minutes) and we will not keep you waiting around on us without an update. 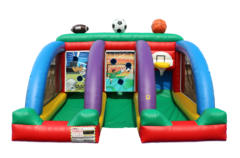 If we see we may not make the delivery window, we will give you a call or text so you are not worried that your party is going to be a disaster without our awesome inflatable rental. We always try to schedule our deliverers at least 30 minutes before a party is supposed to start just for this reason and have yet to not be setup on time. Looking for something that you don't see on our website? Ask us about it! We are constantly ordering new inventory and love suggestions on what people are wanting. Obviously, if your party is in 3 days, we probably won't be able to get you a neon purple water slide with a fire-breathing dragon on top. But, who knows, we may have it next year when you are ordering again. Last year, we received numerous request for a dunking booth, so we just placed an order for one and will be able to be a one-stop-shop for those customers this summer. 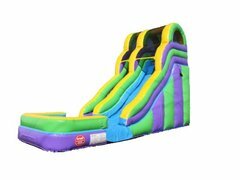 We have just placed an order for 4 new inflatable slides. One of the inflatables is a 20 foot double lane dry slide. 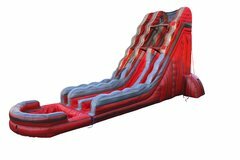 We believe this inflatable will be a great addition to a church or school event. The other 3 items are inflatable water slides. Two of them will be 22 foot water slides and the other is a 15 foot water slide for the younger kids who still want to have some summer fun. 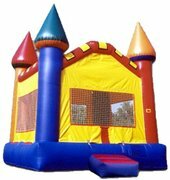 We will be adding a new wet or dry bounce house combo to our rental inventory soon and have our eye on some awesome inflatable games. We will notify everyone via our Facebook page as soon as we have them in stock. 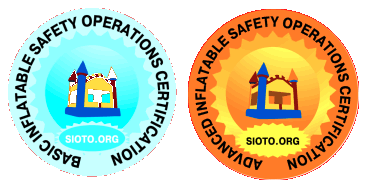 No matter if it is a water slide rental or a bounce house rental, each of our inflatables are cleaned after each use. The process is different depending on which inflatable it is. For a water slide rental, we generally blow up the slide and wash it just like a car, with a scrub brush. Once we have it clean, we then use Odoban to disinfect the inflatable. This prevents the spread of germs from one party to the next. We then let the slide air dry for several hours before putting it back in storage. Once we deliver your rental, we typically will hit the high traffic areas again with Odoban for additional precaution. We will then wipe off any dirt that may have gotten on the inflatable during setup. This is the reason our inflatables look new and our customer rave about how clean they are. Subscribe for $5 off your first rental!